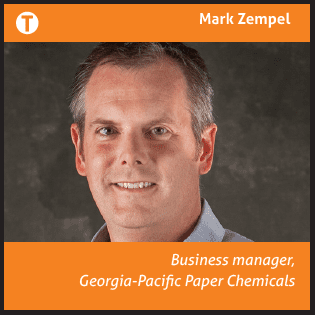 Mark Zempel, Georgia-Pacific Paper Chemicals business manager, describes the path to a wet strength resin with step-change performance claims. A TWM report. For many years, wet strength resins have allowed paper producers to take paper where it normally could not be used – as a replacement for cloth (paper towels), a replacement for plastic (lawn bags), and even a replacement for coolers (beverage cases). Polyamide Epichlorohydrin (PAE) wet strength resins have been used in papermaking for many decades, displacing older technology, to maintain paper strength when the tissue, towel, paper, board, or specialty material is wetted. This strength is typically measured as wet tensile or wet tear, and is often also expressed as the percent of the dry tensile or tear maintained (“wet over dry”). As a mature technology, improvements in wet strength resin performance within the industry have been a matter of fine-tuning until now. PAE wet strength resins have evolved gradually over the decades from low solids, low efficiency resins to today’s 20-30% solids, highly efficient products. Research efforts have led to small tweaks in solids, stability, cost, and performance. Today’s commercial resins balance these factors along with the levels of epichlorohydrin by-products remaining in the resin. These byproducts (1,3-dichloropropanol (DPC) and 3-monochloro-1,2-propanediol (MCPD)) are considered as Volatile Organic Compounds (VOC) content and are limiting factors when seeking food contact certification and are relevant to other regulations as well. Therefore, trade-offs with cost, solids, and performance are made to achieve varying levels of these by-products in the finished wet strength resin. Georgia-Pacific Chemicals has maintained a strong research and product development effort related to PAE wet strength resin technology. This has resulted in regular advancements in the solids, performance, stability, cost, and regulatory profile of PAE resins, exemplified by a large product line offered to the North American Paper Industry. Georgia-Pacific Chemicals’ 25% solids Amres® 1110E Wet Strength Resin has been representative of the state-of-the- art technology for high-efficiency, higher solids, lower cost-in-use resins, as demonstrated by its performance in the lab and in the field against a wide variety of alternative products, and in a variety of grades and conditions. This R&D effort recently resulted in a step-change technology based on a number of innovations that go beyond the gradual advancements in wet strength resin technology previously seen in the industry. These innovations have been combined into a new type of PAE wet strength resin, commercially identified as Amres® Ultra 25 wet strength resin. This technology benefits from the use of novel raw materials and unique manufacturing processes, which have resulted in a major improvement in performance and efficiency compared to even the best alternative wet strength resin. An additional feature of the technology is a significantly reduced epichlorohydrin by-product content compared to our standard resins. This new technology has been granted patent protection. Initial lab results indicated a substantial decrease (approximately 20% dry-on-dry) in the amount of resin needed to achieve a given wet strength test level, and indicated a higher maximum achievable wet test level than with other resins. Both observations implied potential value in the market. Lower resin dosages could reduce cost-in-use and possibly result in cleaner machine operation. Higher maximum achievable wet test could allow grade development, furnish cost optimisation or other operational changes. A typical example of this early lab work is shown in graph 1. Note the consistent reduced requirement for dry resin at a given wet test level, as well as the higher ultimately achievable wet test level. Broad market-based lab evaluations and eventually full-scale machine trials were then carried out. Full-scale trials were initially against reference Georgia-Pacific Chemicals resins in recycled packaging and towel grades as well as in virgin towel. 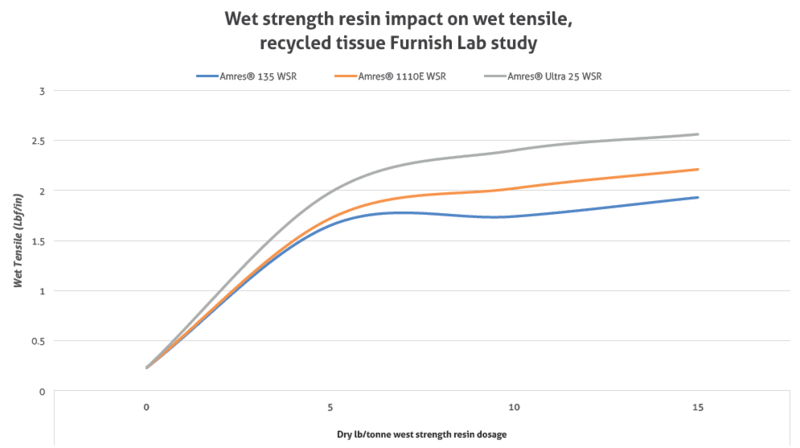 Commercial trial results followed handsheet study projections and consistently showed the ability to reduce dry wet strength resin dosage by 15-35% for equivalent wet strength performance. Graph 2: Average dosage reduction of 31% across all grades compared to competitive products. In addition, successful grade development trials resulted in wet strength levels higher than previously possible. Continued consistent success in full-scale machine evaluations and conversions led to the evaluation of Amres® Ultra 25 wet strength resin against other resins available on the market, again with success both at reducing dry dosage in the 15-35% range and pushing wet tests higher than previously possible. 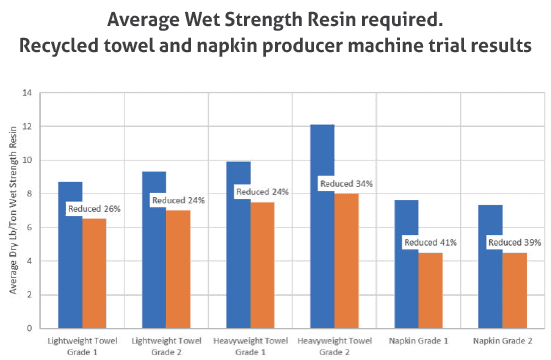 In one example (see graph 2), a North American recycled towel and napkin producer was able to reduce dosage an average of 31% across all grades, while allowing higher wet tensile levels not possible with the competitive product on a new developmental grade. PAE wet strength resin could be considered a somewhat mature technology. Introduction of a new product that can improve on efficiency by approximately 25% or increase maximum wet strength is unexpected, but has now been validated across dozens of machines, on a wide variety of grades and operating conditions. Producers that have converted to Amres® Ultra 25 wet strength resin are enjoying reduced cost-in-use related to the significant dosage reduction as well as the capability to achieve higher wet test levels and higher wet over dry levels than previously possible. In addition, users enjoy the reduction in epichlorohydrin by-products in their processes and finished products caused by both lower WSR dosage and the reduced by-products in the neat resin. Georgia-Pacific Chemicals R&D Centre continues to further develop the Amres® Ultra 25 Wet Strength Resin technology, pushing in all directions: lower byproduct content, higher efficiency and performance, higher solids and lower cost. This article was written for TWM by Mark Zempel, Georgia-Pacific Paper Chemicals business manager. Share the post "High efficiency wet strength resin technology breakthrough"